Big Band Library: April 2013 "Big Band News"
Then – and even better – thanks to the continuing diligent work of Michael P. Zirpolo, author of the mammoth Berigan study Mr. Trumpet: The Trials, Tribulations and Triumph of Bunny Berigan (Scarecrow Press, 2011), Hep Records of England, in cooperation with The Bunny Berigan Archive at the University of Wisconsin, will be releasing a compact disc of Berigan broadcast performances, including at least 12 previously-unissued selections! The original aircheck discs are housed in the University’s Mills Music Library, and will be sonically restored and digitally remastered by respected sound engineer Doug Pomeroy. The exact tracks will be chosen by Hep owner Alistair Robertson, from a batch of airchecks made while Berigan and his orchestra appeared at, variously, the Hotel Pennsylvania, the Paradise Restaurant, and Roseland Ballroom in New York City in 1937 and 1938. Also, a recording that seems to have been made in a studio in the fall of ’38 may also be included. It is hoped that the new Berigan CD on Hep will be out this summer. Hep already has one Berigan disc on the label, “Gangbusters” (Hep 1038), and it’s a very good compilation of music recorded for Victor in 1938 and 1939. Tommy Dorsey was considered by many to have been trumpeter-bandleader Bunny Berigan’s most loyal friend, Norm Krusinki called himself “Bunny’s Number One Fan,” but Bozy White surely had to be his most dedicated researcher. For Bozy, documenting Berigan’s life and career was a labor of love (or should I say an obsession?) for more than 45 years. Even though Bozy was murdered at age 76 in 2004, just before his work was to be printed, his dream has now became a reality, recently published as The Miracle Man of Swing: A Bio-Discography of Bunny Berigan (Eugenia, Ontario, Canada: George A. Vandeburgh and Naperville, IL: Shoestring Records Press), totaling some 1400 pages in two volumes plus an Adobe .pdf index on DVD. So how does Bozy’s work, now finally available, differ from two other Berigan admirers who made it into print before he did - Zirpolo's afore-mentioned Mr. Trumpet and Robert DuPuis’ Bunny Berigan: Elusive Legend of Jazz (Louisiana State Press, 1993)? All three books trace Berigan’s life, career, and recordings and I found each of them to be worthwhile, but they approach their topic in different ways. In fact, in his “Forward,” Bozy acknowledges that his book was not intended as a typical biography. That almost seems prophetic, as Zirpolo, who had been given a copy of Bozy’s manuscript, stepped in; his work is, admittedly, heavily based on the material which Bozy had gathered. In The Miracle Man of Swing, Bozy follows Berigan’s life and career in chronological order, with over 900 interviews of family, friends, and associates, as well as hundreds of hours of research into contemporary press reports and “mini-biographies” of musicians who worked with and for Berigan. How much work Bozy put into this! Bozy also attempted to document, in minute detail, all of Berigan’s performances, whether in-person or on radio or film, and particularly on recordings, listing the catalog numbers of commercial releases of his music in the 78, LP, 45, cassette, 8-track, and CD formats from all around the world. For instance, he located and studied over 2,500 rare 78 rpm records. Despite that tremendous effort, including correcting errors by others, there are still a number of Bozy’s own mistakes or omissions (to take an illustrative slice from the two volumes, such as calling RCA Victor WPT-17 a “10-inch” LP rather than a 45 boxed set on p.811; notating RCA Camden CAL-550 as CL-550 on p.886; Bluebird AXM2-5584 as AXM2-6684 on p.889; saying he is uncertain whether the 12” RCA Victor LPT-1003 is a 10” disc on p.906; showing RCA Camden CAL-550 as CAK-550 on p.921; and writing the CD label Jazz Classics as “Jazz Clas-sics” on p.961). Given the magnitude of record releases and reissues from all over the world, my remark may seem, on a basis of the amount of listings, unfair, but, to me, a discography is nothing without assuring the complete accuracy of whatever catalog numbers are listed. It's difficult getting every number right. There are also some minor typos throughout, like spelling the small Ohio town of Steubenville as “Stubenville” on p.899 and the overlapping text on p.777 and 807. In contrast to Bozy’s format, DuPuis’ and Zirpolo’s texts are more traditional flowing narratives, incorporating many of the same sources. Zirpolo’s, given the benefit of the other two works plus his own 40-year interest in Berigan’s music, arguably comes off as particularly scholarly, with commentary, analysis, and a discussion of the performances from a musical standpoint, to go along with the facts. But, when all is said and done, none of this detracts from Bozy's unparalleled devotion. During his lifetime, he never lost his enthusiasm for Berigan’s music and legacy, and the two volumes of The Miracle Man of Swing are a fine and fascinating tribute to his relentless dedication and search for accurate information. Anyone who has an interest in Berigan owes him a debt. Thank you, Bozy, for your incredible amount of work over all of those decades! Your killer was caught and sentenced in 2006 and your book is at last available to all. recently-discovered private recordings by him in 1933. [ E ] 1220. 24 songs recorded for Command. Just as it announced renewed availability of select Chronological Classics titles and the importing of the Crystal Stream catalog from Australia, Worlds Records of Novato, California has disclosed that it will cease operation after its on-hand stock is depleted. I’ve personally been dealing with Worlds Records since 1974 and it was always a pleasure to get a new catalog or listing of, originally, LPs, and, later, CDs, from Reny. Worlds Records offered the titles I wanted and with good service. Thousands of albums later, I thank you, Reny! Big band fans also took another hit lately as radio host Don Kennedy announced that his “Big Band Jump” newsletter would, after 25 years, end publication. He said that with a dwindling list of subscribers and rising postage costs, it wasn’t possible to go on. However, Kennedy will continue hosting his “Big Band Jump” music program both on radio and on the Internet. Jimmy Dorsey Orchestra directed by Bill Tole. Apr. 10, Orlando, FL. Anderson, IN; Apr. 26, Rutland, VT; Apr. 27, Mamaroneck, NY. Les Elgart Orchestra directed by Russ Dorsey. Apr. 25, Old Bedford School, Bedford, TX. Muggsy Spanier: The Lonesome Road. Derek Smith, b.Apr. 17, 1931. Pianist with Goodman '61 / '67 / '69 / '71 / '72-'73. Harry Carney, b.Apr. 1, 1910. Baritone saxophonist with Ellington. Ken Kersey, b.Apr. 3, 1916. Pianist with Kirk, Teagarden. Knobby Totah, b.Apr. 5, 1930. Bassist with Krupa. Ralph Flanagan, b.Apr. 7, 1914. Pianist –arranger for Kaye. Leader of own band. Billie Holiday, b.Apr. 7, 1915. Vocalist with Basie, Shaw. McKinley, Teagarden, Welk. Leader of Miller Orch. Julian Dash, b.Apr. 9, 1916. Tenor saxophonist with E Hawkins. Morty Corb, b.Apr. 10, 1917. Bassist with Crosby. Chano Pozo, b.Apr. 10, 1915. Bongo – conga drums with Gillespie. Bud Freeman, b.Apr. 13, 1906. Tenor saxophonist with Noble, T Dorsey, Goodman. Henry Mancini, b.Apr. 16, 1924. Pianist – arranger with Miller Orch, Beneke. Joe Dixon, b.Apr. 21, 1917. Clarinetist and saxophonist with T Dorsey, Arnheim, Berigan. Lou Stein, b.Apr. 22, 1922. Pianist with McKinley, Ventura, Hefti, Bellson. Matty Matlock, b.Apr. 27, 1909. Clarinetist with Pollack, Crosby, Hackett. Everett Barksdale, b.Apr. 28, 1910. Guitarist with Carter. Duke Ellington, b.Apr. 29, 1899. Leader of own band. Fans of the legendary trumpeter-bandleader Bunny Berigan have several very exciting things to look forward to, including some new compact discs of rare Berigan performances! 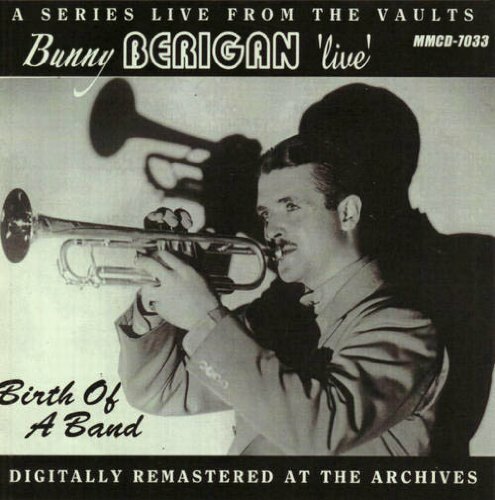 This month, Wayne Knight’s fine Mr. Music label is releasing “Bunny Berigan ‘live’: Birth Of A Band” (MMCD-7033), with 23 tracks such as Dardanella, The Weary Blues, The Goona Goo, Nagasaki, and Am I Blue?, made in 1936 and 1937. The cover of the Mr. Music CD is shown to the right.